The impact of climate change on cattle producers in the Northwest is not expected to be as extreme as other regions of the United States. According to a recent study led by Shannon Neibergs and published in Climatic Change, Northwest producers have a comparative advantage because droughts will be less severe in the Northwest and they have access to feed via extensive irrigation systems than can mitigate the effects of drought. That’s compared to the rest of the United States, though. But what impacts can livestock producers expect here? Can they continue business as usual? Probably not, but there are clear options moving forward, conclude Neibergs and colleagues. 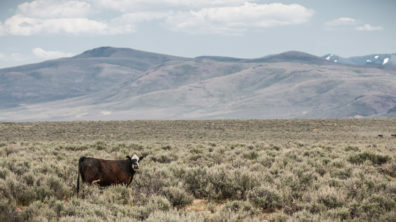 Dynamic rangeland grazing conditions will require coordinating the timing of on and off dates for grazing leases and permits to coincide with prime grazing times as they shift from year to year. Photo: Greg Shine, BLM. Previous AgClimate.net articles have discussed the expected impacts of warming temperatures on snow and water availability in the region. In addition, a recent article explored how vulnerable rangelands are to those changes. In summary, forage productivity may increase but year to year variability in forage quantity would also increase. Historically, supplemental feeding has generally been necessary from November through March. With climate change, forage opportunities will occur earlier in the spring, and as summers become hotter and drier and droughts become more frequent and more severe, supplemental feeding may be necessary during the late summer months. Increased duration and quantity of droughts and high temperatures will also increase fire risk, impacting rangelands, cattle health, and production. A wide array of these activities are currently being implemented by ranchers to some degree. As climate change begins to impose greater and greater challenges on ranching, these practices will become much more important to their sustainability and profitability. Planting shade cover can reduce heat stress. Photo by Greg Shine, BLM. 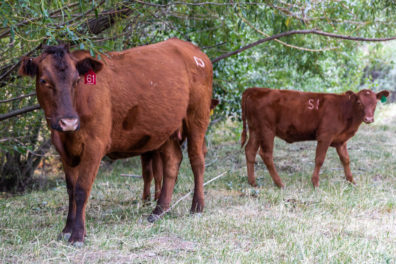 Increases in trucking, labor and management costs of cow-calf producers to provide more supplemental feed or acquire additional grazing allotments. The good news from Neibergs’ research is that these increased costs are not expected to be large enough to reduce cattle on feed inventories, impact slaughter numbers, or processing capacity. At least not in the near future. Also, in the event of drought which can reduce feedstuffs, many Northwest producers have the option to supplement feedstuffs with dryland grains and straw. When stock water can be provided, they can also graze crop residue. Though Northwest producers will experience an increase in costs, the net effect on cattle production profitability will depend on market conditions and the relative effects of climate change in other production regions. The key takeaway from Neibergs’ research is that flexibility will be the key to success. Cattle operations will need to build in flexibility to take advantage of periods of favorable production as well as prepare for uncertainty, variability, and increasing stress from a wide range of climate and market factors. Researchers and land managers are responding to this, and working together to develop tools to help inform producers’ decisions. Stay tuned for further articles sharing these tools as they become available. The study discussed in this article is part of a Special Issue on ‘Vulnerability Assessment of US Agriculture and Forests’ developed by the USDA Climate Hubs, edited by Jerry L. Hatfield, Rachel Steele, Beatrice van Horne, and William Gould in Climatic Change (Volume 146, Issue 1-2). Davies. K.W., C.S. Boyd, J.D. Bates and A. Hulet. 2014. Dormant season grazing may decrease wildfire probability by increasing fuel moisture and reducing fuel amount and continuity. International Journal of Wildland Fire. http://dx.doi.org/10.1071/WF14209. USDA Rocky Mountain Research Station. 2017. Where’s the Beef? Predicting the Effects of Climate Change on Cattle Production in Western U.S. Rangelands. USFS Rocky Mountain Research Station. This entry was posted in Impacts & Adaptation, Sustainable Practices, Variability, Weather, & Extreme Events on November 28, 2018 by sonia.hall.